Discovered by Frank Zappa in the 70s, head-hunted by David Bowie, Talking Heads and going on to play with the likes of Paul Simon, Laurie Anderson, Mike Oldfield, King Crimson and Nine Inch Nails, Adrian Belew continues to go from strength to strength. In a career that has moved with the impact and speed of a freight train, Belew has not only been critical to the work of many other musicians, but has also managed to illuminate the music world as a solo artist - next to his possibly most prominent position as a guitarist and frontman to progressive rock ensemble King Crimson, of course. 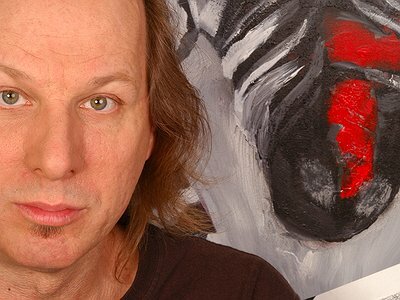 With a legion of dedicated fans that stick with him for every turn and triumph, and as the awards and recognition stack up, Adrian Belew remains the guy that everyone wants in their band. As far back as I can remember singing was my first passion. As a child I seemed to be singing all the time. When I was 5 years old I would sing along with the jukebox in a neighbourhood bar at the end of our street. The adults would give me nickels to feed into the jukebox. I would stand in front of it and imitate the various singers. My first musical instrument was drums. I was in the jr. high marching band for 3 years. What a passion I had for drumming! We lived on the second floor of my grandmother's house. It must have driven her crazy to hear my feverish practicing, but she never said a word. I started writing as a 16-year old junior in high school in 1966 as soon as I had taught myself (incorrectly) a few strange chords. I'm an autodidact in everything I do. At the time I taught myself guitar I was drumming and singing in my first teen band, The Denems. We wore matching denim suits. The Denems emulated everything to do with the so-called British invasion. Seeing the Beatles on the Ed Sullivan show quite literally changed the direction of my life and made me determined to be a recording artist. Before the Beatles my pop influences were mostly singers like the Everly brothers, Roy Orbison, and the Beach Boys. But I always had a great appreciation for music outside of the pop realm. I loved Gershwin, Stravinsky, and film and cartoon music. My first production, at age 31, was my first solo record in 1981, called The Lone Rhino. Artistically there have been many small moments of discovery, which have propelled my work forward. Finding a new sound or technique, mastering a new piece of gear, learning different instruments, and working in various situations with unique cohorts has kept me moving in fresh directions. In my career the big moments are easier to enumerate: being discovered by Frank Zappa, then by David bowie and Talking Heads, followed by joining King Crimson which was a huge leap forward, while simultaneously starting a solo career. Most recently, I have been able to achieve a life-long ambition by performing a composition of mine called E with the Metropole Orchestra. There are too many singular moments I cherish to mention here, but I have a wonderful memory reel in my head. I've saved some of my biggest challenges for right now. I'm attempting to do a new solo work, which is a way of doing music that has never been done before. It requires a new kind of production. The idea has been in my head since 1978! This is my third year of working on it. I can't say more at this point but hopefully you'll hear it someday. As well as the compositional and production challenges, it requires the integration of new software just to hear this music! Only now has technology allowed the realisation of this idea. My triggering mechanisms for starting a new idea are varied. Sometimes I have even daydreamed a song or piece of music. But that's very rare. When I find a new sound or try something I've never been able to do, it almost always results in a musical entity of some sort. So experimenting with sounds and technology remains crucial. However, most of my music comes from good old-fashioned hard work. Sitting with a guitar or at the piano trying to decipher what I hear in my mind. The music i.e. chords and melody comes to me first. Most of the time while I'm writing something I have a good idea of the melody. Words, if there are words, almost always come last. Lyric writing is sometimes the most difficult part. A less traditional way I work is to use the studio itself as my palette. That has been very fruitful. Start with a drum track, add something, take away something, add something else, and so on. To me that process of making a record is much like painting. I record my ideas in the simplest form and listen to them over and over. Eventually I know what to add and hopefully when to stop. Not strictly at first. Improvisation sometimes kick-starts what turns into a composition. But once the ideas are there the improvising has to take a back seat to the compositional process. You still may stumble on new areas by improvising along the way but the task at hand is to formalise your thoughts into, well... a composition. Most often I like to leave space in a piece of music for some improvisation to happen before returning to the composed piece. In live performance I feel some improv is very valuable to keep things fresh from night to night. They are a bit like Lego. You can fit them together many ways with differing results. Of course you can have each without the other but the beauty lies in the mixing of the three. Space can be a very important element in recording. Space can give the illusion of depth or dimension; it can clear the senses for the next onslaught. But space works best as one more tool of composing. To me sound is everything. Composition itself is all about sound. The combining of sounds, including space, and rhythms are what makes a composition. I had to think about that for a moment, but for me the answer is no, I don't feel it's that important. What is important to me is true self-expression. What is ultimate is true self-expression appreciated by your audience, no matter how they reach that point. As much as I love my audience I don't take them into account during the creative process. There is no point in second-guessing my audience. I just have to hope they go with whatever changes I present. That’s two different questions. Let me answer the first one this way: I believe cultural differences have an enormous effect on most everything in our lives including our decision-making. If I had been born and raised in say, Iraq, would I make the same music I make today? Not likely. But this is a not a bad thing. We are all one race but we have many versions of mankind and it's supposed to be that way. Second question: I love listening to music from other cultures but I seriously doubt my perception and appreciation of Indian music, for example, matches that of an Indian musician. Having said that let's not forget music is its own language and can be understood and appreciated by anyone anywhere. That’s the inner beauty of music. As much as I love my audience I don't take them into account during the creative process.